Stronger triathletes bring more power, speed, lean mass, and muscular endurance to race day. While time is a precious commodity for every triathlete, every bit of time spent strength training pays off. Add strength training to your triathlon preparation and become a stronger, faster, more resilient athlete. Strength Training for Triathletes helps you line up a strength program focused on your individual needs. 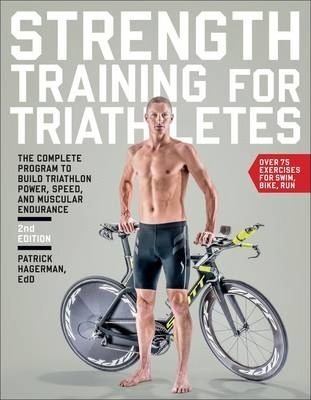 Whether you want to increase endurance on the swim, find more power on the bike, or fight fatigue on the run, the sport-specific exercises featured in this book make it easy to target your training for improved performance in any or all of the three events. Every exercise is clearly explained and fully illustrated, taking the guesswork out of good technique. Many triathletes overlook strength training until race times begin to atrophy or muscular imbalances and weaknesses turn into setbacks. A personalized strength program is the answer. If you have your sights set on racing faster and farther in the season ahead, strength training will get you there. Endurance, strength, and power are the keys to triathlon. Strength Training for Triathletes is your complete resource for building and balancing all three for superior performance season after season.